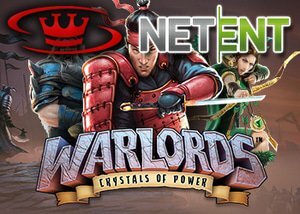 The New Warlords - Crystals of Power slot by NetEnt provides online players with an opportunity to conquer the world while gaining untold riches. Warlords: Crystal of Power is one of the developer's biggest in-house created video slots that has been designed with exceptional animation that is bound to appeal to a mass audience. The anticipation of its release is high for both players and casinos alike. Set in an age where forerunners devoted their days fighting wars over treasures and lands, the years of conflict left only three warlords, including the Samurai, the Barbarian, and the Priestess, each with a power crystal the others are eager to claim as their own. Warlords - Crystals of Power slot offers fans a triple excitement dosage with three different types of free spins that correspond to one of the characters. Each has its own unique benefits, and as expected, it is the scatter symbols that trigger the battle as well as the chance for players to win remarkable prizes. This new slot is now available at all top online casinos, including Casino Luck where players can look forward to astronomical additional wins that can be rewarded by special features such as free spins, re-spins, scatters, stacked wilds, overlay wilds as well as regular wilds. Overlay wilds can activate within any spin of the reels and include three different forms over wilds. Wins of up to 1,000,000 coins can be achieved with assistance from substituting wilds, and random overlay wilds. Three scatters lead the way to the three different free spins bonuses and a battle. Three blue scatters awards the Barbarian free spins, three green the Priestess free spins and three red the Samurai free spins. Each is enhanced by additional features such as sticky wild symbols, re-spins, and multipliers. If two different scatters appear, a battle will take place to transform into one of the scatter to determine which of the free spins features will be awarded. Should two scatters appear, you will then be given a final chance, and a re-spin will take place to try to claim heroic free spins wins. The number of free spins earned will depend on which free spin feature has been won, with this ranging from 7 to 9. NetEnt software's Chief Product Officer, Simon Hammon, shared that the game was created with an incredible amount of effort and that they are absolutely thrilled with the gameplay, soundtrack and 3D graphics all contributing to make Warlords: Crystals of Power a stunning video slot. Fans are bound to be blown away by the interactivity, animations, attention to detail, and again NetEnt has pushed boundaries to ensure the game is what players will enjoy for years to come. Casino Luck is the perfect place to play Warlords: Crystals of Power because they offer a special no deposit offer to ensure that all online players get the opportunity to enjoy this incredible game. Simply use code '10GRATUIT' to get your $10 no deposit bonus. New players can also join Casino Luck with an unbelievable sign up welcome offer consisting of a 100% match bonus up to $150. Register today, take advantage of these great promotions, and while there, enjoy a friendly chat with the super efficient support team to discover the quality that this casino offers.